This book is, as its title implies, intended to supplement the Book of Common Prayer for the Church of India, Pakistan, Burma and Ceylon. Thus it may be thought of as roughly similar to the Book of Occaisional Services of the Episcopal Church. It was approved for use in 1960; the text here is from a 1966 printing. As may be seen from the Table of Contents below, it contains a number of "occaisional" services, plus several items primarily of interest to Anglo-Catholic parishes. 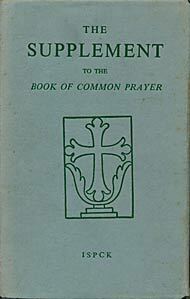 It is listed in David Griffiths' Bibliography of the Book of Common Prayer as 1961/3, and is said to be an optional part of the Indian Book of Common Prayer. The copy used here, however is a completely separate volume.